I will never, ever get tired of Hubble stunners. 100 30 million light years, this object can be seen with binoculars. It's about 100,000 light years across, the same size as the Milky Way, and spirals that massive are rare in the Universe. It's face on to us; with almost no tilt at all. If you could transport yourself to M74 and look back toward home, we'd be tilted about 45 degrees with respect to your view. This image is lush with treasure (click it to get the bigger versions; this compressed view I have here really drains the quality away). Where you see blue are regions where there are bright stars (which tend to be blue). The red areas are gas clouds of hydrogen (which glow at a characteristic red wavelength). Stars are being born there as you look. The yellowish center is where stars have not been born for billions of years; the majority of stars there are older, less massive, cooler, redder. The dark regions are dusty, filled with complex organic compounds which are very efficient at absorbing visible light. Like a city shrouded by fog, the galaxy's starlight is hidden where dust lingers. In M74 in 2002, a massive star, 20 times our Sun's mass at least, detonated in a titanic explosion. It was an epic blast, and astronomers wondered if it might be a hypernova, a particularly energetic supernova. It had many of the same characteristics of a hypernova, though not all of them. Still, how big is such an explosion? Think on this: in the event, the thermonuclear heat and pressure were so high that alchemy took place. Lighter elements fused into heavier ones. The amount of nickel alone created was about 0.07 times the mass of the Sun. That is more than 20,000 times the mass of the Earth. It's far more massive than all the planets, moons, and asteroids in our solar system combined. That nickel was ejected from the explosion at many kilometers per second, and will be scattered into the gas and dust in M74, where it will get mixed in and become part of a new generation of solar systems. That image above is, at first glance, one of serene beauty and eminent permanence. But there are layers to it, veiled dangers beneath the luminescence, struggles between forces beyond our experience. Sometimes these struggles result in birth: stars, planets, even more basic building blocks. Sometimes they result in the destruction of these same things. 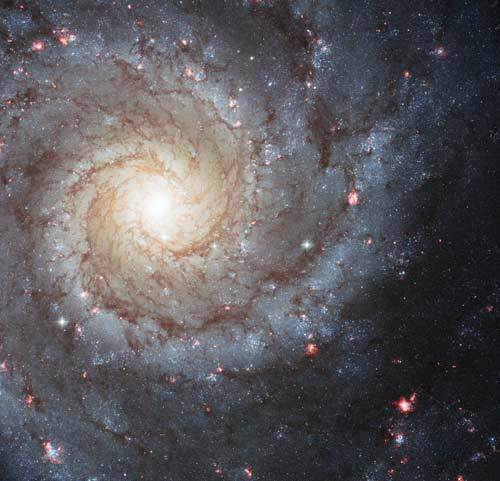 But seen from the vast remoteness of a hundred million light years, they simply combine to form the magnificence of a grand design spiral galaxy.